This table shows a more detailed structure of an individual player including wagering value of a player for each individual game type. Available from the affiliate dashboard, the New Casino Players Report shows Region, Currency, Age, Date Joined, Date of First and Last Bets, the Wagering Value of the player and for which Casino the player has joined. By clicking on the User ID in the left hand column, you will be taken to the detailed player report for that individual player. By clicking on the site in the right hand column, you will see a monthly report for the casino you have clicked on. 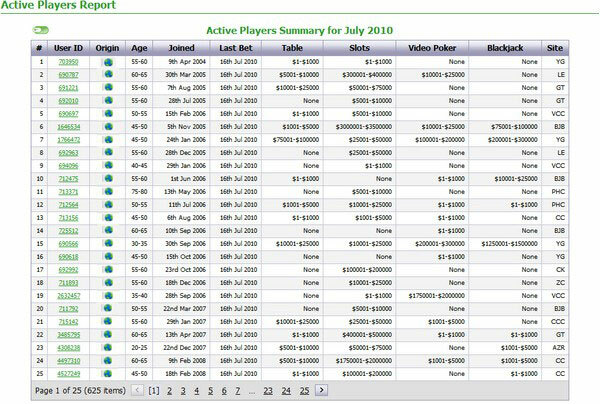 Another report available from the affiliate dashboard is the Active Casino Players Report which shows Region, Currency, Age, Date Joined, Date of First and Last Bets, the Wagering Value of the player and for which Casino the player has joined.